Returning to Russia from a sanatorium in Switzerland an epileptic young man and also a descendant of one of the oldest Russian lines of nobility, Prince Myshkin, finds himself enmeshed in a tangle of love. He is torn between two women—the notorious kept woman Nastassya whom he pities and the pure Aglaia whose soul he finds beautiful. Add to the mix Rogozhin, a man obsessed with one of them. In the end, Myshkin’s honesty, goodness, and integrity are shown to be unequal to the moral emptiness of those around him. He must fail and return to Switzerland. Prince Lev Nikolayevich Myshkin, 26, arrives in St. Petersburg, Russia, by train. The nominal purpose for Myshkin’s trip is to make the acquaintance of his very distant relative Lizaveta Prokofyevna Yepanchina, and to make inquiries about a certain matter of business. He is alone but full of hope and the best intentions. He also likes other people, never judging them unfairly, even those who clearly have erred. Overall he has too much compassion for this cynical age. He believes every person, trusts all, feels the pain of the suffering unfortunates. A result? Most of his compatriots decide very swiftly he has no common sense. Simple? Ill? Just terminally gullible? An Idiot? Or a Saint? That question only you can decide. Still be warned: the drama spans over 660 pages and is hardly easy to follow. Or to solve. I read this one for the first time in my teens and it all went right over my stupid, empty head. I suppose I looked a lot like that guy on the cover (sans the beard and the coat of course but you get an idea) Well, I understood that Myshkin was simply too good and too honest for the world around him but I could hardly grasp why. Was it only because of his illness? Was it also because he was practically a stranger in Russia, a country never famous of fair treatment of strangers? Why was it so important at all? Now I see I was too young to understand the complexity the of author’s mind. Dostoyevski created The Idiot to force us to think about our lives and our choices; the answers to all these ‘whys’ might vary from person to person. The characters, none of them “all bad” or “all good” are very much life-like; in fact there is not one single person in this entire novel that I didn’t feel both sympathy and contempt for at various stages. What’s more the author himself felt obliged to punish practically every major lead in the end and the worst fate was allotted to Aglaia who had to marry a Pole. Why it was such a cruel punishment? Dostoevski hated Poles because he was of Polish descent himself and he loathed that fact, go figure why. Anyway if you encounter a Pole in his novels you might be absolutely sure it will be a villain and a scoundrel. Apart from that The Idiot is brimming with philosophical inquiry into people’s lives, society, culture, and history. Immutable, transcendent ideas about which Russian writers always grapple. The authors of the foreword/afterword reveal and underscore dozens of themes in the book. They discuss mechanics and perspectives and symbols. They discuss Russian history and the Russian concept of suffering, and how these were adroitly parsed among the characters. And how the characters themselves represented the unique attributes–in splinter form–of the Russian whole. If you are intrigued by such a premise you won’t be disappointed by the novel itself. 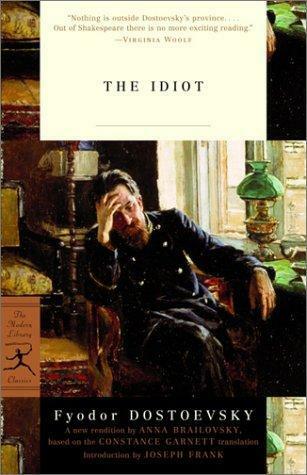 This entry was posted in book review, classic and tagged Fyodor Dostoevsky, reviewing a classic, The Idiot. Bookmark the permalink. 🙂 I need to read a classic – its been too long. Sounds like a Russian version of Sinclair Lewis. A double negative.